Mutoh has come up with an even newer way for you to increase your profits by speeding up your production to complete more jobs - that is to say, more kinds of jobs - in less time! Now, the 3rd generation Mutoh ValueJet 1617H-64" Hybrid (Roll Feed/Flatbed) Inkjet Printer is better than ever, thereby helping you to do this in more ways than one! You can print directly onto corrugated plastics, polystyrene, PVC, acrylic, polycarbonate, foam board, aluminum composite, banner, wall covering, and more. And the ValueJet 1617H 64 inch Hybrid printer is still one of the fastest printers in its class, printing up to 300 square feet per hour (CMYK - roll)! So, if you're interested in getting ahead and making more money, it makes sense to order the Mutoh ValueJet 1617H from SignEquip now. Winner of Wide-Format Imaging 2014 Top Product Award! The ValueJet 1617H Hybrid printer comes standard with table. *Due to the fluctuating Canadian dollar, this price is subject to change. Contact SignEquip for your current quote. Contact us to schedule FREE training at our depot. On-site installation and training is available - Contact us for details. Contact us for low lease rates (OAC in Canada only). Heavier Duty: New Rubber Type Triple Grid Rollers now allow you to feed up to 66 lbs. of roll media or a maximum of 33 lbs. of 1/2" rigid substrate. Crisp, Clear Prints: What else can you expect from the ValueJet 1617H? Your prints will turn out crisp and clear with Exceptional Quality High Resolution and Intelligent Interweaving Print Technology, which utilizes a wave pattern to virtually eliminate banding. Dependable, Flexible Ink System: The new, UV Alternative MP Ink uses state-of-the-art resin chemistry and is about 50% BIO based. This new ink is healthier and has a longer life than UV ink. It also allows you to print on a wide variety of substrates. The hot air blower helps to quickly dry the ink. White ink is available. Now that you know how the ValueJet 1617H Hybrid can help you and your business, you'll want to pick up the phone and place your order now. "This amazing printer pays for itself quickly!" Customize your ValueJet 1617H by bundling it with an optical sensor vinyl cutter for all your contour/die cutting needs. Cutter choices available. Contact us for info and special bundle prices. ABOUT MUTOH: Mutoh-developed plotters, introduced to North America in 1985, earned a reputation within the architectural and CAD/CAM industries for their speed, accuracy and quality. 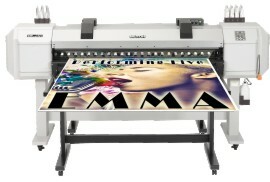 Many awards and technological innovations later, Mutoh America has earned similar acclaim for superior media handling and precision motion control in its new generation of large format inkjet printers and computer-aided sign making (CAS) equipment. Need more info? We're as close as your email or telephone. We love to help you. Our heart is with your business. For one-step service we'll answer your questions, and you can place your order over the phone.